A very warm welcome to the following new club members: Chris and Lewis Bowen; Michelle Jolley; Richard Davies; Jay Leader; Steve Cooper; Sarah Dwerryhouse; Andy Harris; Rachel Stevens; Katie Ellis; Rick Eliason. The next clubnight is on Saturday 4th July from 7pm until 8.30pm at the Cripps pool. Please let Helen know if you are planning to come to the pool and need equipment by Friday 3rd July. Thanks to Russ, Katie, Charles, Michelle and Jon who are doing a great job in arranging the various club trips for this year. Details of all trips are on the next couple of pages. You may also have noticed that Katie and Carolyn have set up a new Facebook page for the School and the club so please if you are Facebook members can you like our page and join the Scubanuts group. You can then post your own diving stories and get updates on club activities. Congratulations to all who have achieved certifications between October and December 2014. 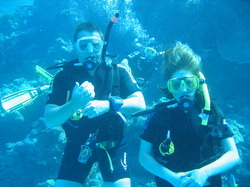 Special Congratulations go to Mel, Ian and James Webb who have achieved the Master Scuba Diver rating. This is the highest non professional rating and is richly deserved. A number of trips have been planned for 2015. Take a look at the Scubanuts website for more details. See the Scubanuts Dive Club Website, Club link or why not check us out on Facebook under Northampton Scuba School or the Scubanuts group for information on holidays, trips and to see what the club is all about.